My local radio club had a couple of years where we lost a lot of members. Many of them were key to our Field Day efforts, including the passing of Bob, W9LO, who had been my 40 meter CW partner for a number of years. It was obvious we needed to get busy recruiting and training younger operators. One rule for serious radio work is that you need to use headphones. There is no way you will hear the weaker stations with the speaker in the radio, or even an external speaker. The problem is that headphones are not very practical when you have several people listening. The solution is that the operator uses headphones and the students can listen on the speaker. 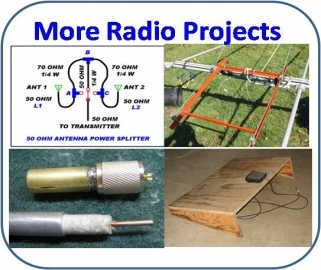 Sure, they won't hear some of the QSOs very well, but they are there to learn operating techniques. Not hearing the other end from time to time won't really be a detriment. If nothing else, they will realize that headphones really are needed as they watch the instructor working stations they can't hear. I decided I needed a simple audio splitter. 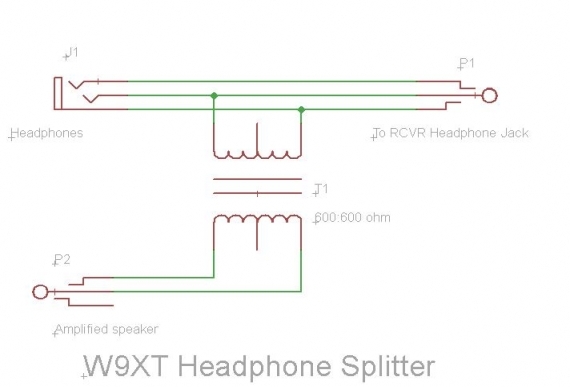 One output of the splitter would drive headphones and the other would drive an amplified speaker. One potential problem is that if you just hook up the amplified speaker and headphones, you can get ground loops and thus add hum into the audio. 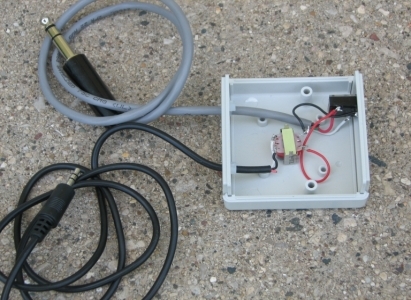 You need to isolate them, and fortunately this can be as simple as an audio transformer. 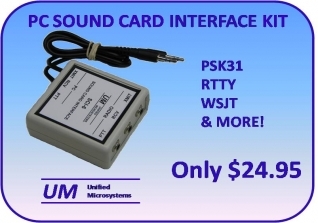 P1 plugs into the headphone jack of the radio. It is directly connected to J1, which the headphones plug into. T1 provides isolation to the speaker, and the secondary connects to P2. In my unit, P2 plugs into an old Radio Shack amplified speaker with a volume control. A better option for others might be one of the inexpensive external PC speakers with a built in amplifier. If you are using one of these, you might want to use a 1/8” jack in place of P2 since the speakers will have a cable of that size to plug int the PC. The photo shows the construction. I threw it together quickly from parts I had on hand. The jack for the headphones is actually one designed to be mounted on a circuit board. I mounted it to an end plate of the case and just soldered the wires to the tabs. The transformer is held in place with hot glue.